The Ed.D. in Educational Leadership is an executive doctorate in leading equitable schools. This nationally recognized program in the Department of Teaching & Leadership provides dedicated students the tools and expertise needed to transform today’s increasingly complex and diverse schools. With each cohort, a select group of highly capable school leaders take the next step in their own learning and leadership. The executive doctorate is efficiently designed around the busy lives of current school leaders. 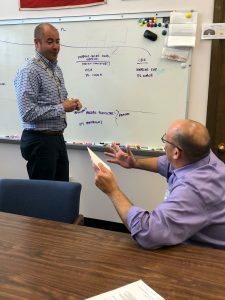 A hybrid of face-to-face and online learning that allows students to become part of a cohort that builds supportive relationships with peers and receives close mentoring from faculty, while continuing to work in an educational leadership setting. Our graduates serve as school and district leaders across New York State and around the country, as well as faculty conducting research and teaching at universities. They also hold roles in government and public policy development, professional development, consultants, and more. An executive doctorate in educational leadership in a supportive cohort model designed for practicing school leaders.